What is scrap metal inspection? Precise scrap metal inspection and testing for composition, grade and purity, is an important part of scrap metal recycling and recovery. According to the Public Notice No 12/2015-20 published by the government of India, shredded scrap is also now subjected to Pre-Shipment inspection. It has been made mandatory to inspect the imported metal recycling waste or ferrous metal scrap for the presence of used or unused arms, ammunition and radiation and certify that the cargo being imported is free of any unwanted material. Within the sphere of global trade, the most crucial challenge that one comes across is to assure the quality of a shipment. Whether or not a shipment corresponds to an associated purchase order or contract is one of the major reasons why inspection of ferrous metal scrap has become an eminent part of metal recycling. Pre-shipment inspection helps confront this challenge and ensures that the shipped goods conform to the specifications and expectations of the buyer. To ensure that the scrap is free from hazardous, dangerous and prohibited things As scrap metal is a recyclable by-product, it requires strict quality interventions. 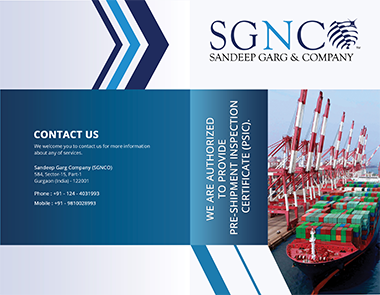 For effective inspection services, SGNCO has a team of highly qualified and experienced engineers. Our expert engineers provide qualitative scrap metal (ferrous and nonferrous) inspections and services in compliance with the international standards. Backed by a network of specialist professionals, SGNCO authenticates that the traded goods comply with their contractual terms. We offer quality inspection services to all sectors of the metal recycling industry to assess the quality, quantity and integrity of the shipped products.